Michelle came to Miami Condo Investments with over 10 years of experience in Miami Real Estate. After graduating in 1993 from St. John’s university in Queens, New York with a Bachelor’s Degree in Journalism, she began her professional career as a copy writer for a publishing company in San Juan, Puerto Rico. 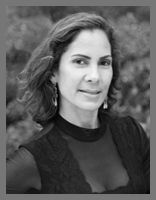 In 1996 she moved to Miami, where she continued her career as a marketing copywriter at Burdines and Macy’s. In 2005, during the height of the Real Estate boom she decided to take a leap of faith with a long-time friend and former coworker, who asked her to become his assistant. She got her Real Estate license and subsequently her broker’s license. As a part of the team, Michelle assisted in the sale of over 40 homes in one year in the Miami Shores area. When the market lagged, she went back into the writing arena, only to return once again to real estate in 2009. This time around, she assisted a Real Estate Broker and Lawyer with his real estate transactions and title work. Michelle is a people person and enjoys communicating with the different parties in a transaction, as well assisting in a smooth closing. She enjoys the intricacies of a deal and is well-versed in contracts, scheduling, negotiations and due diligence processes. In her free time, Michelle enjoys being in nature, whether it be the beach or hiking on a trail. She is an avid fan of traveling, yoga and reading.